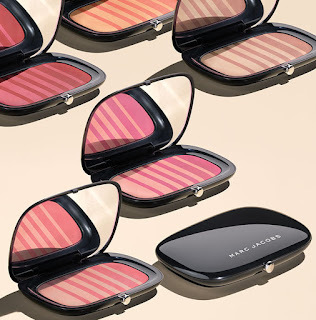 Makeup mavens, you can pre-order Air Blush Soft Glow Duo by Marc Jacobs Beauty. According to the website, the unique striped pattern is inspired by a Marc Jacobs dress. The lighter shade highlights and the deeper shade contours. It comes in various shades with cheeky names (Lush & Libido (500) – petal pink and orchid pink, Lines & Last Night (502) – creamsicle and deep tangerine, Kink & Kisses (504) — pale petal and peachy rose, Flesh & Fantasy (506) – ivory shimmer and goddess bronze & Night Fever & Hot Stuff (508) – cherry and deep plum). 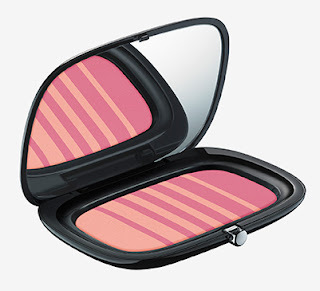 The state-of-the-art blush is infused with air courtesy of new Japanese “Air Power” pigments. Marc Jacobs Beauty Air Blush sales will be donated to amfAR during the month of July, in Way Bandy’s memory. Do you use blush? Will you be checking this one out? Let us know by commenting below.